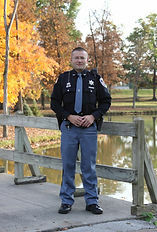 ​Deputy Marshal Dailey began his Law Enforcement Career in 2006 as a Reserve for the Geneva Police Department. In 2009, Dailey was hired as a full-time officer and became the School Resource Officer for South Adams Schools. Following a year-long leave in 2014 to explore options in the private sector, Dailey was once again hired by Geneva as a full-time Deputy Marshal and School Resource Officer in 2015. ​Deputy Marshal Dailey graduated from the 192nd session of the Indiana Law Enforcement Academy's Basic class in July 2010, and the National Academy of School Resource Officers in late 2010. ​As a School Resource Officer, Deputy Marshal Dailey's duties are the safety and security of the South Adamas Schools; when school is not in session, his duties include street and business patrol and criminal and accident investigation in the Town of Geneva. Deputy Dailey can be reached eithe through South Adams Schools or through the Geneva Police Department.